Shimla: In order to provide affordable medicines to the people, Union Minister J P Nadda inaugurated AMRIT pharmacy stores in two premier hospitals in Shimla and simultaneously inaugurated 15 pharmacy outlets in Assam, UP and Punjab through video-conferencing from here. The Union health and family welfare minister opened an outlet (the first for the state) at the Indira Gandhi Medical College, Shimla along with Chief Minister Virbhadra Singh and state Health minister Kaul Singh Thakur and the outlet at Deen Dayal Hospital from Peterhoff, taking the total number of these outlets in the country to 100. 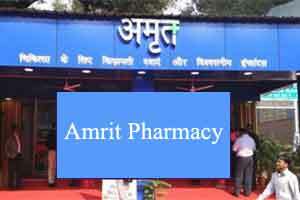 “The NDA government has started the concept of AMRIT pharmacy outlets to give relief to the common man and 164 medicines (branded drugs) for cancer, 191 for cardiovascular diseases and 5,200 other Non-Communicable Diseases (NCDs) are now being given at 50-90 percent less price to the patient,” he said. Nadda said the medicines were being directly purchased from the manufacturers and the outlets were being started at the places provided free of cost so that patients get medicines at cheaper rates. The outlets are being digitally managed. “We have so far provided medicines worth Rs 375 crore for Rs 130 crore to the patients, giving a direct benefit of Rs 170 crore to the patients in the country through 84 AMRIT pharmacy outlets made functional so far,” the minister said. The chief minister, who along with Nadda also laid the foundation stone of Super Speciality block of IGMC Complex to be constructed at Chamyana, 20 km from Shimla said, “AMRIT Pharmacy outlet in IGMC campus will provide medicines at 70 to 90 percent cheaper rates. The chief minister said that the second campus of IGMC to be developed over 20 hectares of land would cost about Rs 250 crore which would be borne by the Union government and the state government in 80:20 ratio. They also laid the foundation stone of Tertiary Care Cancer Centre of IGMC to provide a world-class facility to cancer patients. The new cancer patients per year in the state are around 5,000 and 50 per cent of these are registered at IGMC Shimla. Around 100 patients get radiotherapy every day while 50 patients get chemotherapy daily, the chief minister said. Thakur lauded the Union minister for helping his home state with health projects, adding that Nadda had achieved many milestones during his stint as health minister of the country. Thakur said the state’s request, Nadda had increased the National Health Mission budget for Himachal Pradesh to Rs 407 crore. He sought the help of the Union minister in the construction of medical college buildings and hostels at Nahan and Chamba. Great, but make this type of institution all over India.